Sergeev K.N., Dr. Shalin R.E. , Bulgakova S.G.
An experience of metallic materials application in the BURAN Orbiter airframe construction, the requirements to the materials, main materials and semi finished products are described in the paper. Results of research and development of new metallic structural materials including the 1460 high-strength welding aluminum-lithium alloy, which has good prospects for aerospace systems are also given. The specific conditions of the operation and the level of metallurgical and machinery building basis of the industry had defined the choice of the metallic construction materials for the BURAN Orbiter’s airframe. The operation of the Orbiter in wide range of temperatures required keeping the serviceability and reliability of the materials through as the long-term effect of low temperatures (-130˚C) and as after repeated long heating. Stringent requirements on mass characteristic defined the use of low-density alloys. It was necessary to provide their compatibility to carbon composite materials also used in the construction. When choosing the materials and semi-finished products for the Orbiter’s structure besides the listed requirements the availability of the industry basis for manufacturing the parts was also taken into consideration. If the industry had the basis for producing parts of aluminum alloys, then for the titanium alloy parts they needed to find such alloys and thermal processing techniques that would provide reaching the necessary strength characteristics without building new thermo- vacuum equipment to process long parts. heat-resistant steels and alloys AeP718, AeI742, VZh122, VZhL16, VH4A, ZhS3DK-Vi, VN3. Using of main metallic materials is depicted on diagram. The 1201, VT23, VZh122, AeP742, ZhS3DK-VI, VN-3 alloys were not used in the planes’ design. However characteristics of these alloys were most advanced for the BURAN Orbiter from point of view of weight-efficiency. NPO MOLNIYA in cooperation with VIAM and TsAGI specificated the volume of tests to estimate serviceability of the chosen materials. Special attention was paid to low temperature tests (-130˚C), estimation of long-term strength and creeping in the range of operational temperatures, destruction toughness, and the effect of treatment by thermal cycles on the mechanic properties. More tests were carried out on aluminum alloys, which operate in conditions close to the loading and thermal limits. Some comparative data on them are given in Table 1. Thermal cycling tests of the 1201T1 and D16chT1high-strength aluminum alloys were carried out at temperatures from –130˚C to +150˚C with simultaneous effect of loads and temperatures corresponded to conditions in real flight. The samples of sheets and plates of the D16chT1 alloy and plates of the 1201 alloy sustained 100 loading cycles whereas the sheets of 1201T1 alloy broke after 40...60 cycles. Therefore the D16 aluminum alloy with lower impurity, i.e. of higher chemical purity, was used for skin, ribs, stringers and other sheet-made parts. To improve the corrosion resistance of the parts exposed to multiple continuous heating they were artificially aged. The primary structure of airframe and cabin were made of the 1201 welding heat-strengthening aluminum alloy, which was new those days. It was designed under the leader of Academician of the Russian Academy of Science Frilyander I.N. (VIAM). The quantity production technology developed in cooperation with VILS, VIAM, and the industry’s metallurgic plants allowed to make high-quality semifinished products with guarantied level of mechanical properties and stringent requirements on allowable defects registered by ultrasonic checking of semifinished items products and blanks. Later the 1163T1 (of D16ch type) high-strength heat-strengthened aluminum alloy was used for non-welded primary structure (rings, walls, longerons) instead of plate forming of the V93 pchT2 alloy and plates of the 1201T1 alloy. This became possible due to the works done under the leader of Mr. Leshchiner L.N. (VIAM). This work was directed on optimization of the alloy chemical composition, improving the technology of thick plate’s production, and consequently improving the destruction tightness. The use of the 1163T1 alloy decreased the weight of the construction and eliminated buckling after mechanic processing of V93pchT2 parts. The use of artificially aged 1201, D16, and1163 alloys required considering their features in both designing of parts and manufacturing and assembling. 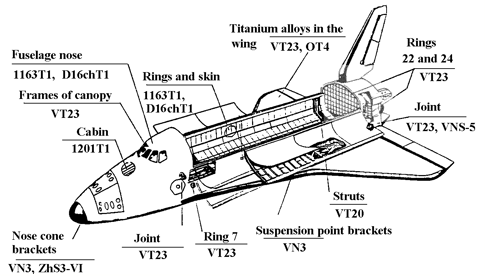 Considerable advantages of titanium alloys – higher specific strength compared to steels and aluminum alloys, wide range of operational temperatures from -253˚C to +600˚C, and high corrosion resistance – make for their wide usage in spacecraft and, particularly in the BURAN Orbiter’s design. A comprehensive study of large-size plates and forging of main aircraft titanium alloys, VT20 and VT22, as well as VT23 which had never been used in aviation before. 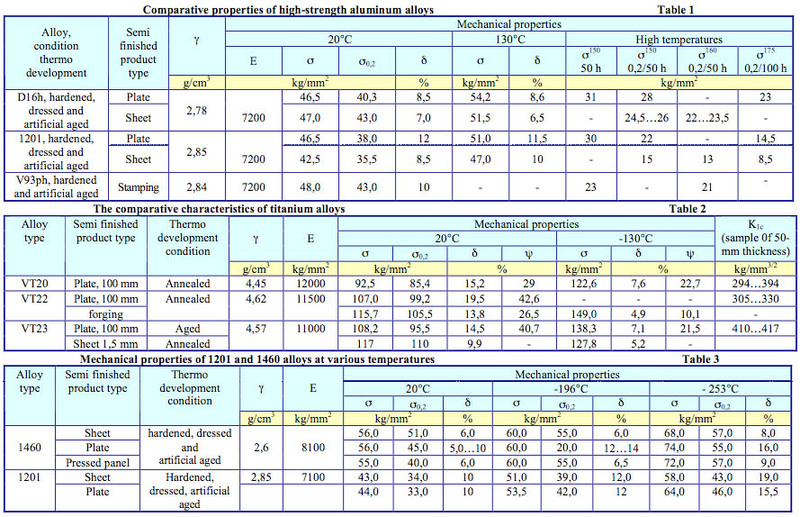 Some comparative features of these alloys are given in Table 2. The VT23 alloy was chosen for the primary elements operating at low temperatures (-130˚C). This alloy has best combination of strength and ductility in these conditions. Thermo cycling of the VT23 alloy samples in the conditions, simulating the operational ones increases yield strength by ~15 kg/mm² with a small increase of ultimate strength. The ductility remains unchanged. The tests show that under BURAN Orbiter’s operation conditions using of the VT23 alloy with the strength level of σ = 110…125 kg/mm² (for plates and sheets) and σ =100…125 kg/mm² (for forging and rods) is optimal. Further strength increase is expediency because of decreasing of crack resistance, plasticity, especially at subzero temperatures, and consequently, reliability of primary units. The BURAN Orbiter’s most loaded units and parts are made of VT23: highly-loaded double-walled frames, upper and lower booms of primary frames in middle fuselage, struts, canopy frame beams, parts of nose and rear attachment points, longerones of fuselage rear part etc. The technologic properties of the VT23 alloy, created by Mr. Khoreev A.I. (VIAM), and the techniques of thermo-mechanical processing, developed in cooperation with VIAM, VILS, and VSMPO, allowed to manufacture various products from 115...169 mm thickness plates to 0,08 mm foil. The plants of the aircraft industry in short time started producing all the types of semifinished products used in BURAN’s design. For hot structural members securely operational at very high temperature (up to 1200˚C) and stresses the VN3 niobium alloy was chosen with VIAM-developed ‘chrome-titanium-silicon’ protective coatings. The VN3 is a mid-alloyed niobium-based alloy with comparatively low density (γ = 8.6 g/cm³) and appropriate combination of thremophysical properties at high stresses in vacuum and oxidizing environments. One of the main purposes of niobium alloy brackets is to attach the thermo-loaded ‘carbon-carbon’ material parts. The essential condition of the unit proper operation is good compatibility of carbon-carbon parts and the coating of the niobium alloy parts. The “chrome-titanium-silicon” coating system, applied using a thermal diffusion saturation technique met these requirements. Initially the coating is supplied in powder. Heat-temperature nickel-based casting alloys were used in some units attached the wing-leading edge to fuselage. They are referred to as ZhS3DK-VI, ZhS6U ‘blade’ alloys and were for the first time used in shaped castings of structure elements (brackets). The technique of precision investment casting with oriented crystallization in vacuum was used. This allowed to produce parts which almost don’t need further mechanical processing. In friction units, operating in both high and low temperatures and deep vacuum, the VZhL16 specially-developed alloy with a complex anti-friction coating, and the VNS17 widely known steel also with a special complex coating were used. The VKS210 and VKS170 high-strength construction steels were chosen for high-loaded non-standard fasteners. A unique electron-beam evaporation- vacuum condensation technique of nickel and silver precoating to soldered honeycomb panels of the rudder-airbrake driven casing and the elevon’s flaps was used to gain their high reflecting power. This technique was designed by VNIIMetMash, VIAM, NIAT and NPO MOLNIYA. When creating the BURAN Orbiter considerable advanced development was performed in metallic materials, manufacturing and application of semifinished items. For instance, a complex technology of making cylinder- and cone-shaped varied thickness cold-rolled pipes of VT23 high strength titanium alloy for braces was worked out. Also the technology of manufacturing of hot-rolled and pressed thick-walled pipes of the same material for the hydraulic accumulators was developed. Efforts were made to introduce beryllium, which having low specific weight, height module of elasticity, and high heat capacity. The quality of the obtained semifinished items, the developed technology of thermal processing and production, and the test results of the sample units proved the reality of these plans. A comprehensive study of the 1440 aluminum-lithium alloy newly-developed under the supervision of Dr. Frilyander I.N. and Leshchiner L.N was carried out. A technology of producing plates up to 55mm-thick and 5- and 6 mm skin sheets, thermal processing technologies and structure member producing technologies were developed. An experimental part of the fuselage was built. A 1460 new high-strength welding aluminum-lithium alloy was developed under the supervision of Dr. Frilyander I.N to replace the 1201 alloy in the welded constructions of the aerospace system including tanks for cryogen fuel. This alloy based on the ‘aluminum-copper-lithium’ system. It features low density and high module of elasticity. 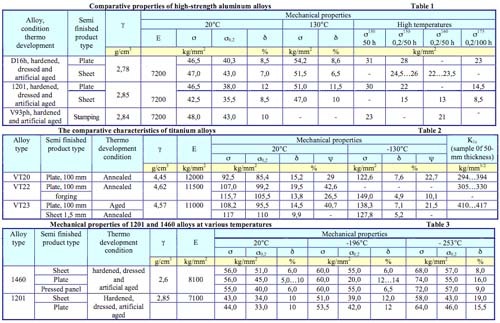 Comparative properties of 1460 and 1201 alloys at normal and cryogen temperatures are shown in table 3. A complex of researches and tests within the certificate data was carried out on the 1460 alloy. The technologies of large-size ingot melting and casting, production technologies of hot-rolled sheets, plates, forged pieces, pressed panels, and flared rings were developed in cooperation with VILS, KUMZ, and VIAM. The production series of the 1460 alloy sheets and plates were tested for mechanical, service life, and corrosion properties as well as is welding characteristics including its welding to the 1201 alloy. The tests proved the prospects of the new material. A rich experience of developing and employing metallic materials in the aerospace vehicle designs was gained by the metallurgists of the enterprise closely cooperating with the specialists of industrial and academic institutes and metallurgists of the supplier-plants. Comprehensive researches of metallic materials on development stage, R&D of both new and early created materials, construction parts tests, static and other tests of BURAN’s airframe, horizontal flight tests, as well as the real BURAN’s space flight proved the correct choice of materials and their serviceability. The experience of developing and employing new metallic construction materials, the studying methodology of alloys and semifinished items, features of parts production technology, and the advanced development of new technical solutions were used for the MAKS Aerospace System. This experience will inevitably come in handy when designing and producing new aerospace system. 1. Shalin R.E. The Ways of Further Aerospace Materials Development // Almanac of the 1-st Aerospace Conference, vol. 5. – Moscow, RIA, 1995, p.p. 4-26. 2. Frilyander I.N. Aluminum Deformed Construction Alloys. – Moscow, METALLURGIYA, 1979. 3. Aviation Materials. Magnum And Titanium Alloys // Reference book, vol. 5. – Moscow, ONTI of VIAM, 1973.